Ecuador. with an area of 256 370 km2, is a country well know for its mega-diversity. The country has 1659 bird species according to birdlife.org and Sachatamia Lodge with over 320 species is an idyllic place to enjoy some of this diversity. This private ecological reserve in an area of 120 ha. of lush cloud-rain forest near Quito is an ideal location to visit whether you are planning to have a day trip together with friends or a relaxing weekend with the family off the beaten track. The ecological reserve is located near the protected forest of Mindo, an area well know for the biodiversity in Ecuador. Click here to find the best rates and availability. – Rent a car if you would like to go at your own tempo, taking pictures and enjoying the landscape. It takes about 2 hours to get there. – You can book a day tour with a tour operator, it is a full day tour which would include other activities besides birdwatching. – The most low budget option is of course to take a local bus that will bring you directly to the middle of the town of Mindo. avoid the hassles of planning and logistics and book a tour to Mindo here. If you are in Sachatamia I would love to see your pictures. Best season to visit goes from November to June, when birds return from the mountains from their mating season. Sachatamia is aware of the importance that human impact has on ecosystems, and has made sustainable tourism a part of their core business. Spend the night at Sachatamia Lodge, and you will enjoy a peaceful and charming lodge with well-furnished cabins. 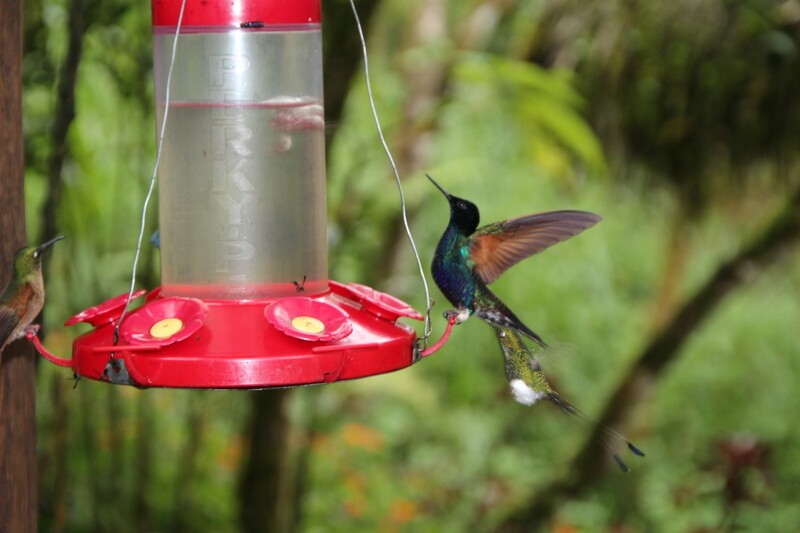 The feeders are strategically located, so that you will find yourself admiring a myriad of birds and specially hummingbirds, together with stunning settings anytime, a great option is to eat outdoors. Some of the hightlights of Sachatamia Lodge. Here is a video to make you decide to visit this peaceful place, whether it is for a meal or to spend the night in this charming lodge. 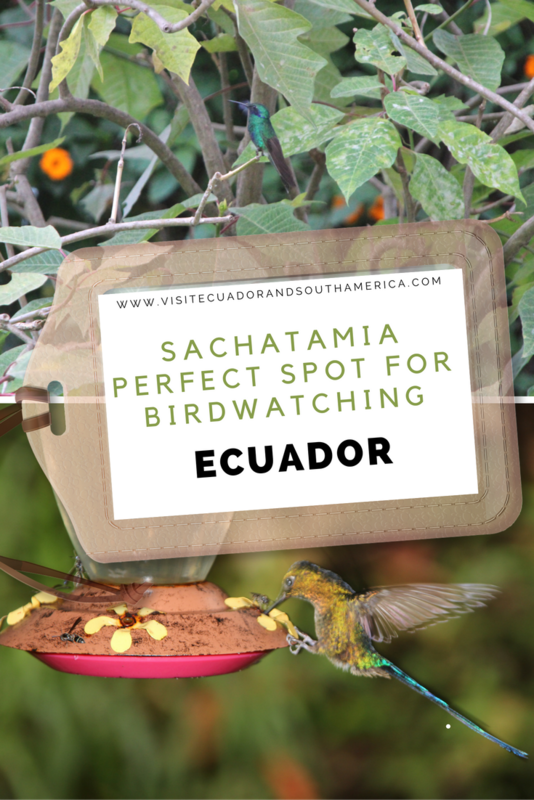 This is of course a hotspot for birdwatching not only in the area but in Ecuador as well. In addition, it is also a perfect place to enjoy outdoor activities, such as zip lining and hiking. There is a nice path down to a lake past the swimming pool, where you can take a break, take a good book and rest in comfortable chairs while you are inspired by the beautiful surroundings and magnificent birds coming so close, that you will think they are there in order to greet you. It is amazing to admire the wide variety of birds that kept showing along the way and the beauty of their colors made this a fantastic experience, not only for me but for my husband and my parents as well. They could not stop taking pictures and we were all just delighted by all the beauty mother nature had put together in this special place. Disclosure: I was the guest at Sachatamia Lodge, however, all opinions expressed here are entirely my own and based on my personal experience. Have you been to Sachatamia Lodge? What was it that you enjoyed the most? ⟵Tips to enjoy Ecuador low-budget !